Recolllections scrapbooking photo sleeves - vacation; Recollections scrapbooking photo pages, "Memories made easy"." Vacations"- The kit includes 6 heavyweight, acid- free sleeves,..
Recolllections scrapbooking photo sleeves - vacation; Recollections scrapbooking photo pages, "Memories made easy"." Vacations"- The kit includes 6 heavyweight, acid- free sleeves, with die cut openings for photos. 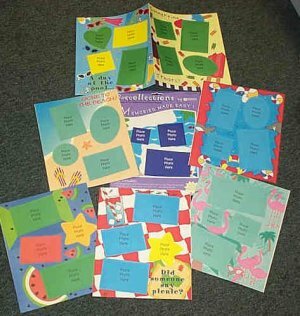 Each 11" x 17 " insert folds to 8 1/2" x 11" pre-drilled to fit either a 2- hole scrapbook, 3 ring binder or clear protective sleeves. Simply place the photos in the openings for the finished look. This kit has pages that have to do with vacations. (picnic, beach, pool, etc) Great for a beginner scrapbooker or an experienced scrapbooker. Other types also available. Scrapbooks and stickers are also available. Great holiday gift for the beginner scrapbooker in your life.